Ian was born in Kensington, London but at an early age went to live in Santa Barbara with his parents until the age of 7. When Ian returned to the UK he lived for a short time with his grand parents in London’s East End and got to know the area where his mother grew up and didn’t find out until many years later that they lived not far from where Matt Monro was born in Ironmonger Row in Shoreditch. 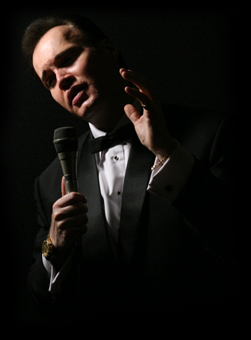 Ian knew, even from his early childhood, that he wanted to be a singer like his great hero’s Matt Monro and of course Frank Sinatra so he began taking singing lessons at the age of 11 with four different singing teachers. One of Ian’s earliest memories was listening to Matt’s great recordings and trying to emulate his breathing technique so much so that when Matt appeared in the mid-seventies in Yarmouth Ian badgered his parents to drive from London to watch his show. Ian sat through the matinee performance and then went straight back into the theatre in the evening performance to watch him again. The seeds of Ian’s life long obsession were sown Ian began singing in London Pub’s even though he was underage, he would sneak in and sing with the bands just as Matt Monro had done himself many years before. Ian later found out that he even sang in some of the same venues. His first big break came when his last singing teacher arranged for him to audition for the big band singer in the film ‘Yanks’ featuring Richard Gere. He was chosen for the part out of 400 others at the age of just 16! The movie was a huge success, taking 4 months to film and he sang with an 18-piece band, which he greatly enjoyed. He then fronted his own Jazz quartet performing at club venues. At just 20 years of age he started cruising on the original Oriana, performing with a production company, in such starring roles as Tony in West Side Story. While Ian was cruising Matt Monro was on a world tour, Ian tried several times to meet with Matt but always managed to miss him, on one occasion, by only an hour, when Matt was performing in Hong Kong. When Ian returned home he auditioned for Radio 2 and was picked as a session singer for BBC’s live orchestras. He was to be featured as a male vocalist on BBC Radio 2. Having a vocal range of nearly 4 octaves, he has been able to transform both contemporary standard tunes into a style which makes him an individual performer constantly being in demand as an international artiste. Ian has performed at the London Palladium, The Talk of the Town, (which was one of Matt’s favourite venues) and The Savoy, to name but a few. He was the only male vocalist invited to perform to the British Troops during the First Gulf War. He has had the honour of going to Buckingham Palace to perform in a charity concert.